I try to not over indulge in carbs. So when I have a bowl of pasta it needs to be something special. And, I don't know about you, but I love fresh pasta. 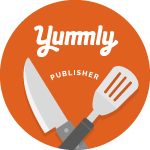 I love the lighter texture and better flavor. With that said, as you know, I am a slacker and never take the time to make my own homemade pasta. 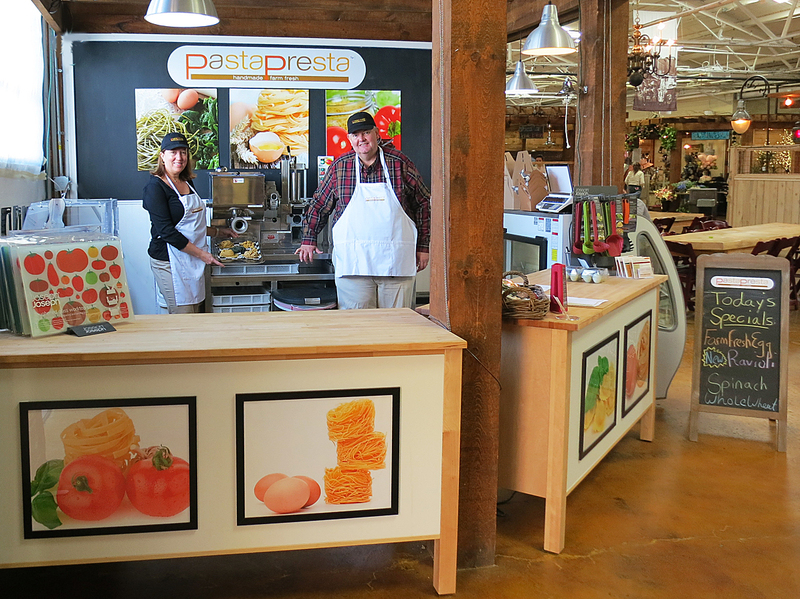 That's why I was excited to hear about PastaPresta, which just opened in the SoNO Marketplace. 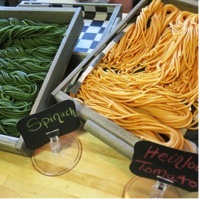 They make fresh, hand-made pasta using farm fresh ingredients and seasonal produce. According to their website: They only use organically grown semolina, durham and whole wheat flours. They use Pete & Gerry’s brand heirloom eggs from New Hampshire. Plus, they use heirloom tomatoes, spinach, arugula, mushrooms, beets, garlic, red pepper and other produce from farms in Connecticut and upstate New York. As someone who works with her husband, I appreciate that PastaPresta is a husband and wife team - Bill and Meri Erickson of New Canaan, CT. They spent years living abroad and loved the sense of place, season and community surrounding food and the local markets. They wanted to bring a piece of that lifestyle back home to Connecticut. PastaPresta offers traditional egg, spinach and whole grain pasta and raviolis. Additionally, there will be special weekly flavors highlighting seasonal ingredients such as heirloom tomato, roasted garlic, beet, arugula, and more. Things like spaghetti, linguini, fettucini or pappardelle can be cut to customer’s specs. They also make unique shapes including casarecce, gigli or campanelle. Much to my delight they also make the thick spaghetti-shaped Bucatini. In my house growing up, bucatini was the only choice for a spicy marinara sauce. It's not very easy to find as a dried pasta let alone as a fresh one. This is reason enough for me to travel to Norwalk and see what PastaPresta is all about. The opening of PastaPresta also marks the U.S. debut of the patented Pastation by Pama Parsi Macchine s.r.l. of Rome, Italy, a leading global manufacturer of pasta machines. This single machine is a pasta maker, ravioli machine and sheet cutter all in one. You'll be able to watch this machine in action. “Besides the theatre of watching us make our fresh pasta, and discovering what new tastes will be showcased each week, we hope that our customers will come by often to chat, to connect and to share the friendly marketplace experience we so enjoyed every day in Europe,” said Meri. PastaPresta is located in the SoNo Marketplace at 314 Wilson Avenue in South Norwalk, CT. They are open from 10am to 6pm every Friday, Saturday and Sunday. For more information, visit www.pastapresta.com. Have you been to the SoNo Marketplace? Have you tried PastaPresta yet? What did you think?